I thought it's a tool to save web images to your Pinterest board while browsing but no, it's a tool to browse your Pinterest account from a pop-up box. Great panel, very easy to navigate in your folders without having to go to the Pinterest site ... I really enjoyed it! My other 2 browsers have apps which allow me to pin pages, this does not? Wouldn't a bookmark do the same thing? Very bummed. I wish Opera got as much focus on app/extension development as do the other guys. PLEASE, can SOMEONE - ANYONE - work on a Pinterest pinning app for Opera? Pinterest™ Panel by linderdorothy is an excellent, efficient, and time saving extension that anyone who uses Pinterest regularly should have. For business users on Pinterest it is a must have. 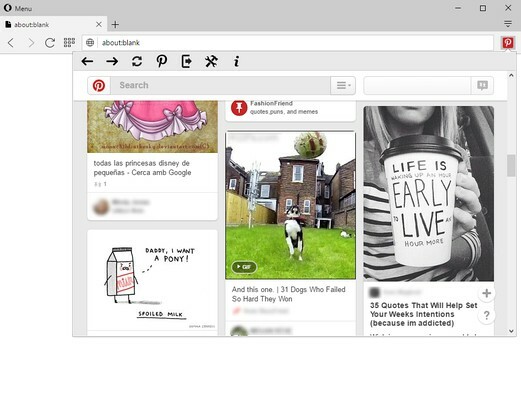 No more having to use memory resources to open a full browser page just to check something or add something to Pinterest. The only slight drawbacks are that the panel is not persistent. As soon as you click out of it, the panel disappears. This is very annoying when trying to copy paste a link, its title, and description which requires three steps which means opening the panel three times. The only other slight drawback is there is no link showing but that is easily overcome by simply right clicking on the item you are wanting to share. I gave it 5 stars because the drawbacks are slight. Thank you Dorothy Linder for a great extension. Why can't I install the Pinterest button that lets me automatically add a page that i like to my Pinterest page? It seems all other browsers have this available and it is a great feature.